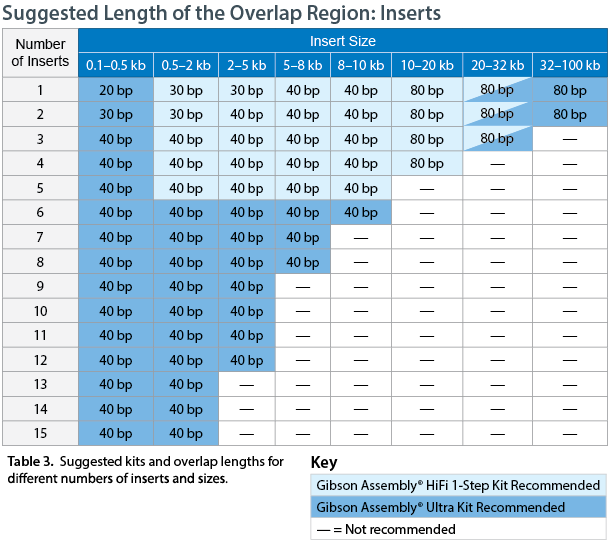 To help you create fragments with appropriately designed overlaps, SGI-DNA has gathered some helpful primer design strategies to keep in mind when using PCR to generate DNA fragments for your own Gibson Assembly® cloning reactions. Remember when designing your homologous overlap that the length varies based on fragment length and number. Use the wrong fragment length, and you risk your DNA fragment not assembling properly. The table below shows the overlap length needed based on fragment length and number. The optimal length of the overlap region depends on the number and length of the fragments in the assembly reaction. Longer overlap regions will result in higher efficiency when working with multiple fragments or longer fragments. Avoid tandem repeats, homopolymers, high secondary structure, and extremely high or low GC content. All of these can result in an efficient annealing of your overlapping regions. If you encounter these regions, you may want to consider selecting a different region. To get a single amplification product when generating overlaps by PCR, it may be necessary to optimize PCR amplification reactions when using PCR primers with long homologous overlap regions. Adding a restriction enzyme site to primers between the overlap region and the sequence-specific segment enables subsequent release of the insert from the vector. In this case, be certain that the restriction enzyme site introduced in the primers is not also present within the insert. Want to make your primer design even easier? Check out the Gibson Assembly Primer® Tool. Download the Gibson Assembly® Cloning Guide for additional tips and tricks for performing Gibson Assembly® cloning. I am very happy to see this type article. it is very useful and exciting. the best blessings of this article custom essay writing is giving properly idea to each and every readers and also it's giving correct impressions. Looking forward to new article.